This item is an image. It was created by an unknown creator on or around the date time period: 20th century. toy box : packaging for Fun Ho! 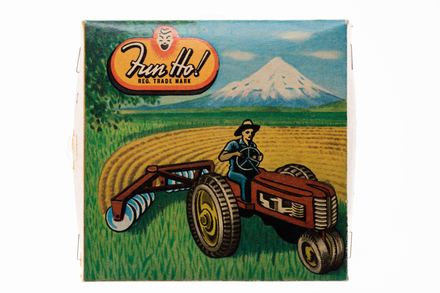 Farm Set No 3 box, yellow with green, grey, blue and black, image of a man driving a harvester, marked "FUN HO! REGD TRADE MARK", "FARM SET NO.3 / MANUFACTURED BY THE UNDERWOOD ENGINEERING CO LTD / INGLEWOOD NEW ZEALAND".